MILWAUKEE, Nov. 9, 2017 – Baird announced today that it received a perfect score of 100 percent on the 2018 Corporate Equality Index (CEI), a national benchmarking survey and report on corporate policies and practices related to lesbian, gay, bisexual, transgender and queer (LGBTQ) workplace equality, administered by the Human Rights Campaign Foundation. Baird joins the ranks of 609 major U.S. businesses which also earned top marks this year. The 2018 CEI rated 947 businesses in the report, which evaluates LGBT+ related policies and practices including non-discrimination workplace protections, domestic partner benefits, transgender-inclusive health care benefits, competency programs and public engagement with the LGBT+ community. 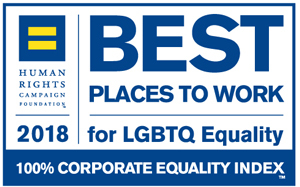 Baird’s efforts in satisfying all of the CEI’s criteria results in a 100 percent ranking and the designation as a Best Place to Work for LGBT+ Equality. Baird embraces and supports its LGBT+ associates, clients and communities. The firm is committed to creating a workplace where all feel welcomed and encouraged to be their authentic selves every day. Spectrum, Baird’s LGBT+ Associate Resource Group, celebrated its 5th anniversary this year and provides educational sessions, networking opportunities and outings for LGBT+ associates and allies. Spectrum has also formed partnerships with a number of community organizations including the Cream City Foundation, UWM LGBT Resource Center and is a leading corporate fundraiser for AIDS Walk Wisconsin. Baird is an employee-owned, international wealth management, capital markets, private equity and asset management firm with offices in the United States, Europe and Asia. Established in 1919, Baird has more than 3,400 associates serving the needs of individual, corporate, institutional and municipal clients. Baird has $171billion in client assets. Committed to being a great place to work, Baird ranked No. 4 on FORTUNE’s 100 Best Companies to Work For in 2017 – its 14th consecutive year on the list. Baird is the marketing name of Baird Financial Group. Baird’s principal operating subsidiaries are Robert W. Baird & Co. Incorporated in the United States and Robert W. Baird Group Ltd. in Europe. Baird also has an operating subsidiary in Asia supporting Baird’s investment banking and private equity operations. For more information, please visit Baird’s Web site at www.rwbaird.com.